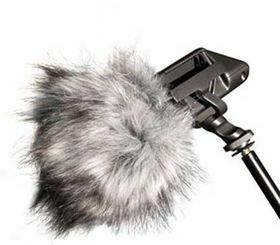 The Rode Dead Kitten Artificial Fur Wind Shield is designed for use with the Rode Stereo VideoMic, Rode Stereo VideoMic Pro, Rode WS4 and Rode NT4 microphone. It's specially designed with artificial fur that minimizes wind noise, while also remaining acoustically transparent. The Dead Kitten is actually the exact wind shield included with the Stereo VideoMic and it's designed to suppress noise caused by high-wind while outdoors.